Are you getting frustrated with selecting one out of hundreds of WordPress Beauty Spa themes in the broad theme market? 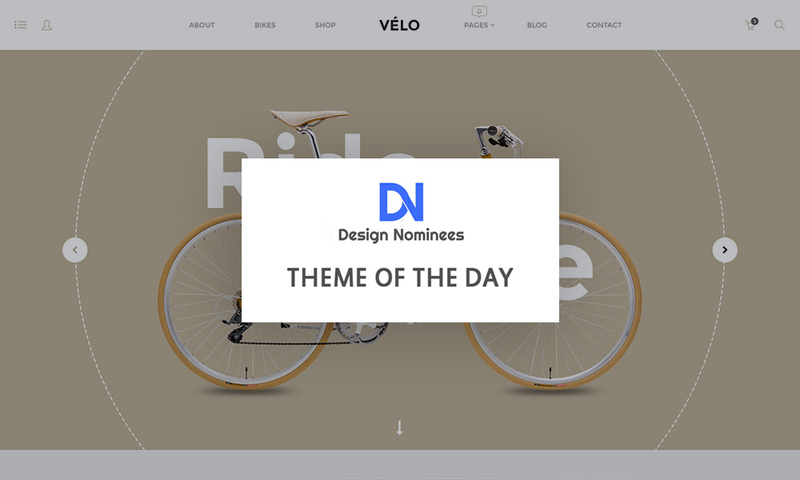 If the answer is Yes, you are in the right place for seeking one excellent theme. Herein this writing, I will give descriptions of 9 most marvelous WordPress beauty spa themes so your range of choice will be lessened to a great extent. 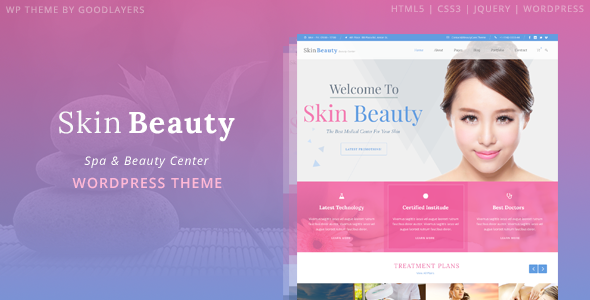 These 9 beauty spa themes share some similar characteristics such as Clean Modern Design, Fully Responsive, SEO Optimized, and Built-in Plugins Included for free. This can not get rid of the fact that they each owns one unique package of theme features. It is recommended that you check their live demos for the best consideration. 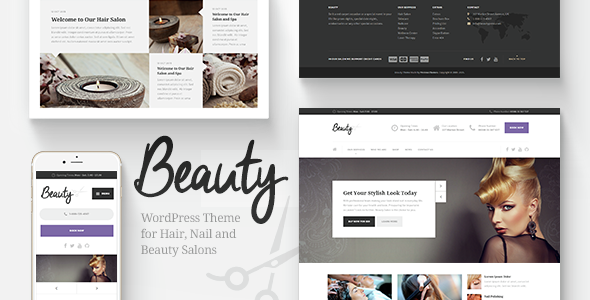 Beauty is a premium WordPress beauty template with light and clean design. This beauty template is a smart choice for beauty salons, hair salons, wellness centers and similar businesses. Beauty has everything necessary to assist customers in upgrading their websites to the next level. The theme is integrated with Page Builder so it is easy to build or rebuild websites. With its intuitive Drag & Drop interface, creating pages is not irritating and daunting at all. Thanks to Visual Composer included in the package, users can install a copy of CV and start building their website from their WordPress Dashboard. Owing to One Click Demo Installer, the theme can be ready to run just in one click. Moreover, Supported Extensions & Add-ons offered by Beauty makes sure that Beauty is compatible with Contact Form 7, Custom Sidebar, Advanced Custom Fields, Yoast SEO, WP Rocket, WP Featherlight and WooCommerce. Besides, Beauty comes with many other likeable features such as Translated into 14 Popular Languages, Real-time WP Customizer Page Layouts, Custom Widgets, Responsive & Retina-Ready, Solid Foundations, etc. 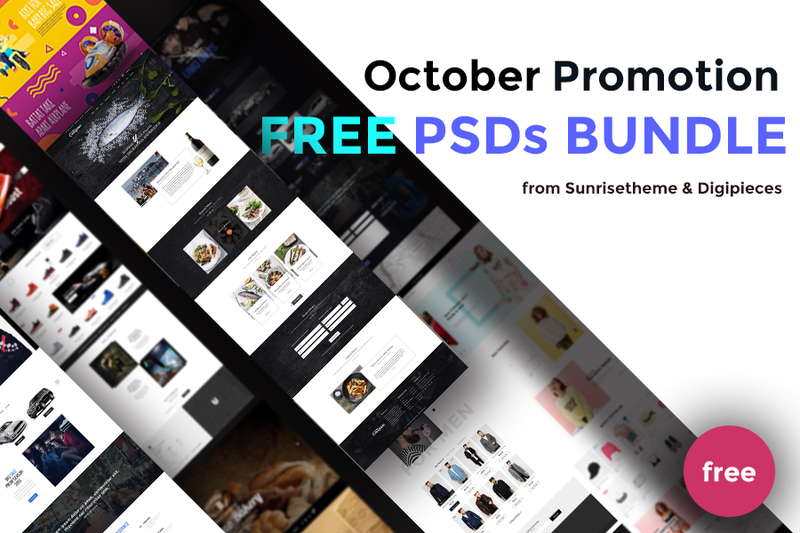 It is incredibly fantastic that purchasing Beauty is entailed with another freebie and entitlement to access to a whole range of goodies including all of other free PSD files by Beauty’s authors. With fundamental great features, Beauty gains a great deal of love from WordPress customers. Check Beauty’s live demo here. RoseMary is a responsive WordPress theme with a clean and modern design. The theme allows users to start or promote any Yoga, Spa, Beauty, Hair Salon or Massage Room Business, including Spa, beauty, massage, health care, makeup, massage, nail, physiotherapy, skincare, hair, wellness or yoga websites. To see how great RoseMary is, its numerous features need taking into consideration. 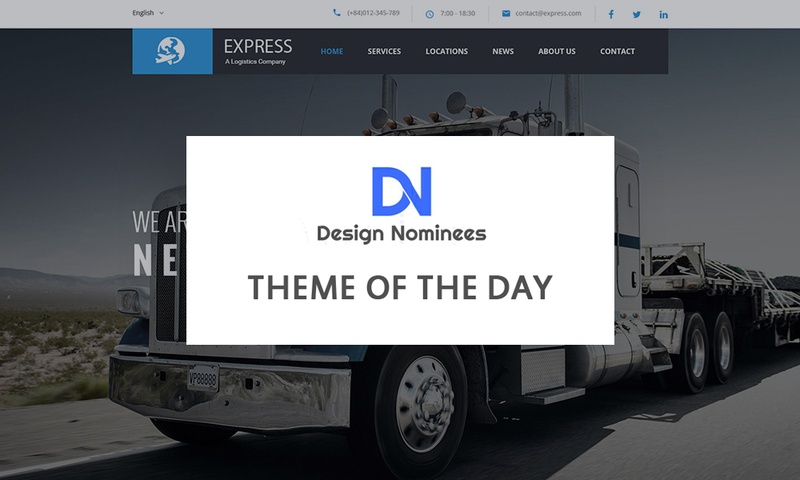 The theme is fully responsive and 100% Retina ready. It comes with awesome built-in plugins: Revolution Slider, Booking Calendar, Essential Grid, PO Composer, Visual Composer for creating any layout at different tastes. The theme is integrated with WooCommerce, One Click Demo Install, Mobile Device Optimization, SEO Optimization and Translation Options. Besides, Unique settings inheritance & Override System, Media Content Manager, Shortcode Builder, Extensive and Free Support & Updates are also in the list of RoseMary’s theme features. With such a lot of awesome features and stunning design, RoseMary’s Live Demo deserves your watching. Wellnesscenter is a responsive single page WordPress theme. The theme perfectly fits with a Wellness, Spa or Beauty Salon Business, namely spa, salon, beauty center, parlour, massage center, health care, make up, massage, nail, physiotherapy, salon, skincare, wellness, yoga . Based on Boostrap 3 Framework and designed with a dimension of elegance and perfectness, Wellnesscenter will not disappoint its demanding customers. This theme includes Powerful Booking, Contact Form and Newsletter Subscription Forms. It’s built with hassle-free Drag & Drop Page Builder to make things easier. The package of outstanding features also includes Unlimited Color Scheme, Two Home Variation (Text slider & image slider), Visual Form Builder, One Click Demo Installation, Multi-functional Gallery, Client’s Review Section and much more. 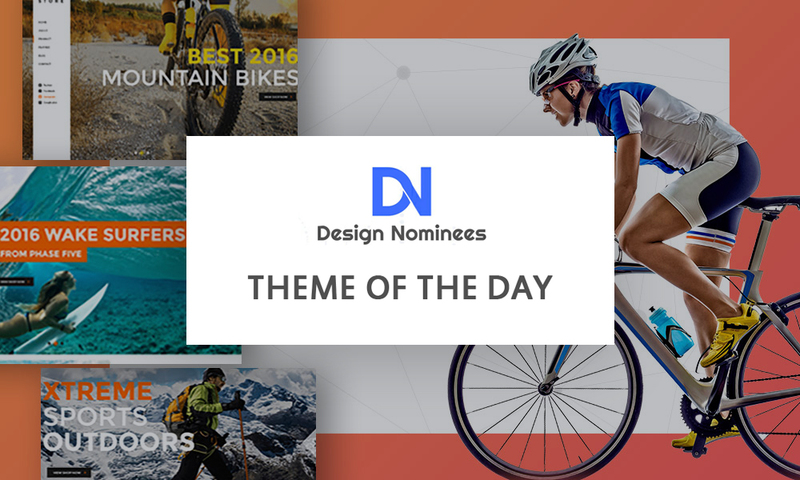 Browse through the theme’s Live Demo here for more details! Yolia is in line with WordPress beauty spa templates that are designed in a minimalist style. This WordPress template suits for any type of yoga, spa, beauty business. Yolia is constituted by a wealth of great theme features. Here are some striking ones: Visual Composer, Revolution Slider, Clean Code & SEO Optimized, One Click Dummy Install, Fully Responsive, Mega Menu, Font Awesome Icons and Premium Support 24/7, Child Theme Included, Support Modal Account Login, Advanced Option Panel, WPML Compatible & Translation Ready, etc. Take a look at Yolia’s live demo here to see if you have a taste for this design style. Skin Beauty is a clean responsive WordPress theme. This spa template aims at Beauty, Spa, Salons, Yoga, Barbershop, Care, Hair, Health, Massage, Medical, Physiotherapy, Wellness Center, Makeup, Cosmetic, Treatment. Skin Beauty offers 4 blog styles, 7 Portfolio Styles, Theme Customizer, Font Uploader, Font Awesome, Unlimited Sidebar Color, Google Font, Shortcode Generator, GoodLayers Imported and Testimonial. The beauty theme is integrated with WooCommerce, Page Builder with Master Slider, Mega Menu and WPML. Additionally, Skin Beauty is packed with Scalable Container, Floating Navigation, Optimized Code & SEO, 100% Responsive, Awesome Shortcodes, Parallax/ Color Section and Landing Page Templates, etc. Don’t hesitate to take a look at the theme’s live demo here. 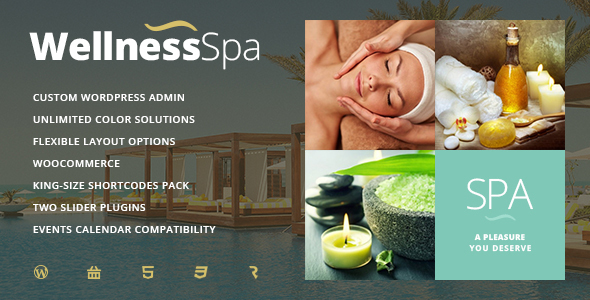 Wellness SPA is a responsive versatile WordPress beauty theme. The theme is meant for spa, resort and other beauty websites, like hair salon websites, massage salons, cosmetology, spa procedures, body therapy, beauty studios and various resorts and sauna. Wellness SPA can be a hamam and sauna site, as well as a timetable theme for any beauty and hair salon, spa therapy, wellness sections, resort services etc. Wellness SPA owns a wide range of amazing features. The theme features full compatibility with WooCommerce, Translation & WPML and Events Calendar Plugin. Thanks to its being Plugin-Friendly, the theme can be compatible with a great list of popular plugins. The theme is packed with 99+ Custom Shortcodes, Drag & Drop, Layer Slider and Revolution Sliders so users can build and manage websites efficiently. Moreover, Wellness Spa has SEO Optimisation, Responsiveness, Animations, Color Management, Custom Post-Types, and Google Fonts, etc. 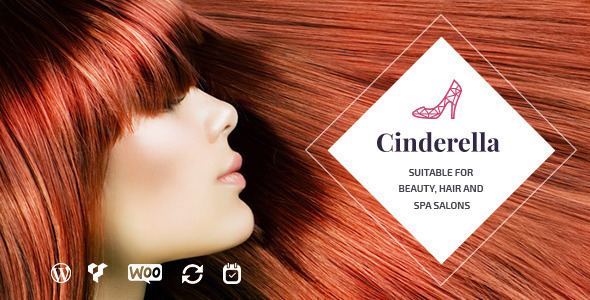 Cinderella is a particular responsive theme for a single local salon and a network of salons with multiple locations. However, it is also able to equally fit with other beauty-related websites such as spa, nail salon or massage. With its elegant and fully responsive design, Cinderella will make a perfect solution for beauty-specialized websites. Cinderella provides users with 4 color schemes, 2 nice header layouts, and 2 services listing layouts. Due to its intuitive interface and flexible Visual Composer Page Builder, the theme is easy to modify and enjoyable to use. With Advanced Theme Options, users are able to fully customize the theme to match any branding and any purpose. REDUX Powered Theme Options enables users to have easy-to-set-up options for their websites. Thanks to One Click Demo Importer, your website can be ready in only one click. 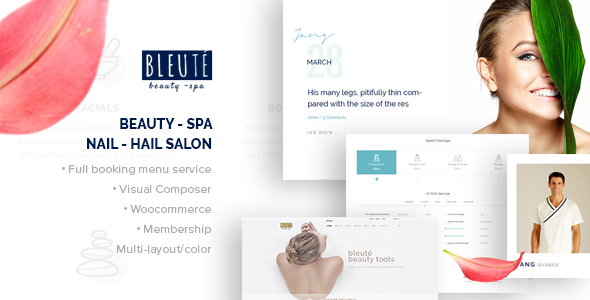 Besides, this WordPress beauty spa theme is integrated with Slider Revolution, Nice and Convenient Booking Form Powered by Bookly Lite and Translation Ready & WPML Compatible. Moreover, the theme feature package include PSD files, Audio & Video embed, Font Awesome Icons and 630+ Google Fonts, etc. Check out its live demo here. 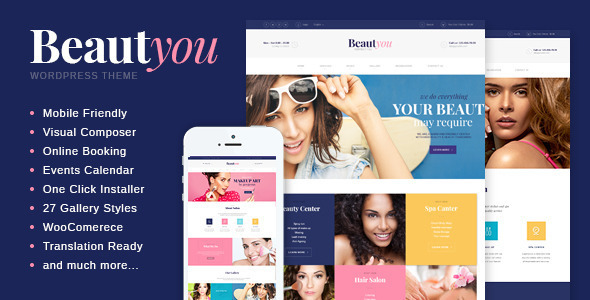 Beautyou is a design targeting multiple beauty sites like Spa, Saloon, Health Care, Beauty Store and other Blogs and Magazines. 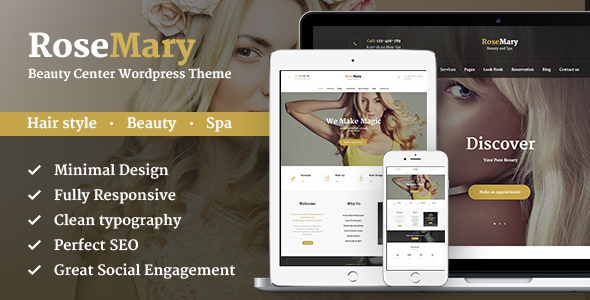 The theme serves beauty-related services and owns its unique elegant modern beauty. Beautyou comes with WooCommerce store, Multilingual support, One Click Demo Installer, Visual Composer & Shortcode Builder, Revolution, Flex & Swiper Slider and Menu Configurator. Other outstanding features that should not be excluded are Mobile Friendly, Online Appointment System, Child Theme Support, Google Fonts, Multiple Layout & Color Options, Interactive Ajax Search, SEO Ready and Unique Setting Inheritance and Override System. To know Beautyou inside out, take a glimpse at its live demo here. Bleuté is designed not only for spa but also for the other beauty services such as: nail, hair, make up, massage… even yoga centres. This trending theme possesses a fashionable appealing style and diversity elements that can satisfy almost all strict builders. Bleute has a preferential package of nice features. With unlimited color, flexible layouts and easy custom homes, users can choose the best suitable color to make their brand stand out from the crowd. The theme is packed with Contact Form 7, Google Fonts, Mailchimp API, Awesome Fonts, Powerful Theme Options, Online Document. Besides, it is integrated with Visual Composer, Master Slide, Advanced Custom fields Pro, Add-on Repeater Customfields (all can save you $104 in total). Check it’s live demo to verify the theme features here. Hardly anyone can deny these perfect WordPress beauty spa themes which own so many stunning features. However, please don’t be appalled by some possible problems that may happen during setup or customization process. There is no need to choose a template with as many features as possible but just pick up one that is most suitable for your style. After all, I hope that you can be satisfied with the one that you will select.